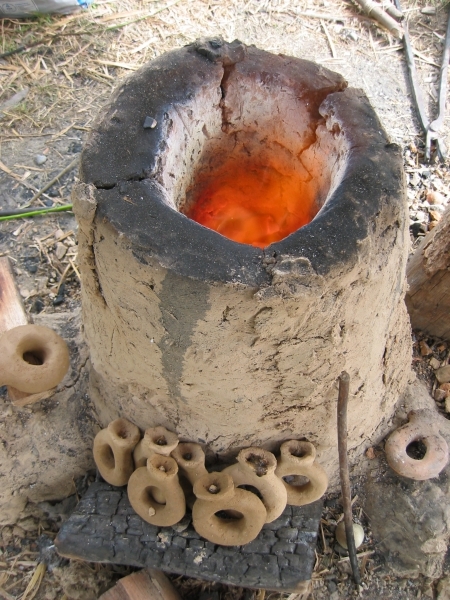 The production and casting of metals is a very old trade and is known at least for the last 7000 years or so. Early evidence for mining can be found at Ai Bunar, Bulgaria and Rudna Glava, Serbia from 5000 BC onwards. Casting is a very efficient and cheap way to manufacture a desired good. This is especially true for metals. Casting processes can be discerned by the way a mould is produced. There are two possibilities: permanent moulds and lost moulds. Lost moulds can be used only once. In order to retrieve the raw cast you have to destroy them. Permanent moulds can be used for multiple casts; they are usually made of two, three or more parts, to allow for the retrieval of the cast. Lost moulds require a pattern permanent moulds do not. Moulding process should further be classified by the way the model or pattern is handled. There are lost models and permanent patterns. Generally patterns is the term for models used for sand-casting, whereas with the lost-wax method it is often called a model. But as far as I can see, the English/American terminology is unfortunately rather ambiguous. This page is concerned primarily concerned with heritage casting processes, which is why modern processes are not discussed here, however I make use of modern terminology wherever feasible. In the literature lost moulds are often said to be moulds of the lost wax or cire perdu process. This is incorrect as sand moulds are also lost moulds, as are the others mentioned above. In brief, the lost wax process uses positive wax model which is being invested in a moulding material, then heated, upon which the melting wax produces the mould cavity. This requires an individual model per cast. Early bells were made like this. The English/American terminology in the humanities coined the term direct and indirect lost wax process. This addresses the means of making the wax model, i.e. if each wax model made individually from scratch, or if the wax model in itself was replicated by more efficient means, e.g. from a mould. Some time after the 12th century the use of the lost wax method for bell founding was replaced by a more wax-saving process, which we nowadays call traditional bell founding process. This uses a strickle board to make the bell model from fine clay, which is used to make the two-part mould. Before casting the false dell (clay bell model) is removed. A similar technology came to bear in the production of cannon and, again, slightly modified also for the production of vessels such as cauldrons. The single most important method mentioned her should be casting in sand moulds, which re-uses its permanent patterns. Sand moulds on the contrary possess permanent patterns which are being reused every time a sand-mould is made. 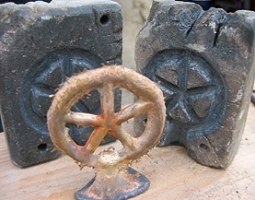 Casting in sand moulds cannot be traces back very far. The earliest mentioning of this technique in our hemisphere is probably Al Jazari aorund AD 1200 . Susan La Niece published an excellent article putting forward the scarce evidence we have for early sand casting . In central Europe the earliest evidence is tzo found in written sources of the 16th century . Suggestions put forward by Egg that Gregor Löffler had introduced sand casting to gun founding are without any substance and reveal a simplistic view of foundry processes by that author. Since pure clay is too fat, i.e. it shows too much shrinkage in pure form, the clay must be made leaner. This is done with inorganic and organic materials, which is called temper or grog. Archaeologically proven and/or historically/ethnographically documented temper is e.g. : (quartz) Sand, crushed old forms, animal hair, horse manure and chaff. The clay acts as a binder for the inorganic, refractory ageing agents. Since these do not shrink during drying, the shrinkage of the moulding material can be adjusted via their proportion. Organic tempers have a different function; they improve the plastic properties in the green state. Due to their fibrous shape, they reduce cracking during drying. They improve the gas permeability as they burn when firing the moulds. The moulding loam is/was produced by each foundryman himself/herself and can be produced with experience at any place where work is/was done. The raw materials are available everywhere. Historical sources such as Theophilus Presbyter in the 12th century , Vanoccio Biringuccio or Cellini in the 16th century share their recipes with us. Also at Lazarus Ercker, the famous sampler and metallurgist of the 16th century, you can find some hints on how to use clay to produce refractory materials . You do not need a model, but you have to engrave a three-dimensional negative into the moulding material. You also want to be careful as to ensure that the cast can be retrieved from the mould halves. This seriously restricts the design of your object and at least for prehistoric times this moulding technique yielded far less complicated cast products than the lost wax process. They are also more labour intensive to manufacture. The advantage is the re-usability of these, and many objects can be cast without much effort once a mould is made. The materials for permanent moulds have to be refractory and hard-wearing, e.g. stone and metal. This entry was posted on Thursday, June 20th, 2013 at 13:16. You can follow any responses to this entry through the RSS 2.0 feed. You can leave a response, or trackback from your own site.